Lastnight at the Hyatt the talk turned to Liberace. I started it, because I had been reading something about Liberace. We were listening to Jackie Jocko and I asked Jocko what Liberace had been like, in his experience. You do not have to ask Jocko if he knew Liberace! You know he did. In this case though Jocko said he did not know him well. But he said, "We had some good conversations." He said Liberace confided in him, "Jocko, I am not a good pianist. But I know how to market myself. I know how to be a good showman." Jocko said, "Oh, he was a beautiful guy!" Leonard Pennario did not like Liberace and we explored that subject next. 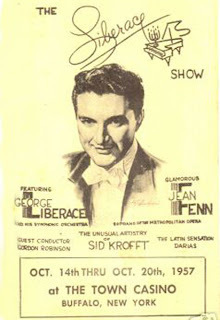 Liberace bugged Pennario because here Liberace was, Italian and a pianist, so I guess people would compare them. And Liberace stood for everything Pennario did not so it used to make Pennario mad. Last night I saw what the problem was. Because Jocko asked me, "Did Pennario ever play the Town Casino?" The Town Casino was a legendary old Buffalo cabaret. Here is a program from the Town Casino featuring ... guess who? I said: "NO PENNARIO NEVER PLAYED THE TOWN CASINO!" How did I get mixed up with all of them? Terribly sorry to tell you this, but Liberace was Polish. My mistake - I looked it up and his father was Italian. I was thinking of his first name: Wladziu. 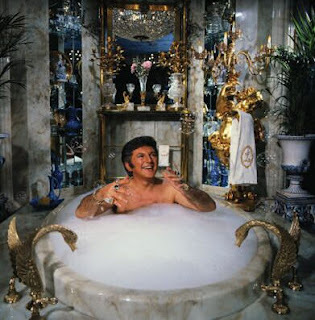 Liberace was quite a character! If you're ever in Las Vegas, be sure to visit the Liberace museum. Part of it was closed for remodeling, but it definitely was worth the price of admission to see half of it. That is a great first name, Wladziu! Budd, you are the only person cool enough to have gone to the Liberace Museum.